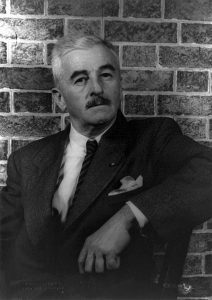 William Faulkner's As I Lay Dying is widely considered one of the great American novels. Quite an accomplishment, especially considering that Faulkner wrote the novel in six weeks while working at a power plant in 1929-30. Read more about his day jobs here. Thanks to HarperCollins, you can now listen to Faulkner, himself, reading from his masterpiece: .au file (4.4 Mb), .gsm file (0.9 Mb), .ra file (0.5 Mb). The audio can be a little difficult to make out at times. But you can read right along with the text in Google Books. Enjoy. Thanks MS.
For more audio classics, check out our collection of Free Audio Books. MS? as in M$ ? As I Lay Dying was always my favorite of all his books. Something about the stoicism of those people reminds me of similar survivors in Texas. The diversity of what he wrote is amazing. Thanks for posting this. I’ll admit that I haven’t read As I Lay Dying, but I’ve always loved Faulkner’s short stories. Definitely going to give this a listen. So is this a good choise to read for school or should I pick another one instead? Machelle, I’ve taught Faulkner’s fiction all my adult life, and I suggest you start with another of his books. I don’t know your age and reading experience, but if you really love books and have read a lot, you might start with his greatest, “Absalom, Absalom!” (It will take a while to get into it,but oh my, it’s worth it). “The Reivers” is Faulkner’s last book and comic and fun. “Light in August” is a book I never can put down. I’ve never understood why “As I Lay Dying” is the Faulkner novel taught in high schools. Machelle, I teach this to my senior Advanced Placement classes and love it for its dark humor. Faulkner knew what that was all about long before Hollywood exploited the humor in pathos. Love this book, which has the same effect on me as Waiting for Godot…sometimes laugh out loud, sometimes tears streaming. Thank you for allowing me to hear Faulkner’s words in Faulkner’s voice. My God! Faulkner really was a Southerner. I can barely understand him. His accent is thicker than Barry Hannah’s or Flannery O’Connor’s. It’s easier to understand Cash or Darl or Anse on the written page. A British critic called “As I Lay Dying” a black comedy, and I’m glad to read shashinyc re: its comedic and tragic aspects, both. It occurred to me that it antedates “Godot” by 30 years. I think Faulkner played it both ways, as both comedy and tragedy. You care too much merely to laugh, but the stupidity forces that, too. Finally, like Beckett’s work, it addresses the human condition in all its schizophrenia. I found “Light in August” very moving. Not overwhelming at all, by which I mean that unconventional 20th century literature can sometimes be rather weighty and difficult to comprehend. Does this website still have the recording of Faulkner’s Nobel Prize speech? I have read all of his books, some were very hard to understand but I would usually read them over again. We studing “Light in August” in high school. It was excellent!